Disable Autorun is a free utility which helps to selectively or completely disable all Autorun capabilities for computers that run Windows 2000, Windows XP, Windows Server 2003, Windows Vista, Windows 7, and Windows Server 2008 systems. The main purpose of Autorun feature is to provide a software response to hardware actions that you start on a computer. 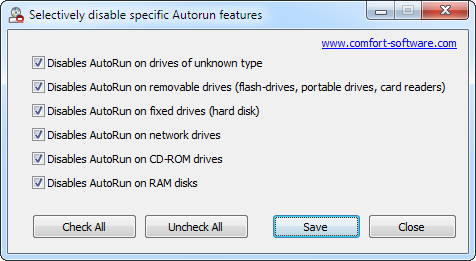 Autorun has the following features: Double-Click, Contextual Menu, AutoPlay. ...... card readers and other gadgets). During AutoPlay, the Autorun.inf file from the media is parsed. This file specifies which commands the system runs. Many companies use this functionality to start their installers. In versions of Windows that are earlier than Windows Vista, when media that contains an Autorun command is inserted, the system automatically executes the program without requiring user intervention. Because code may be executed without user's knowledge or consent, users may want to disable autorun feature because of security concerns. Qweas is providing links to Disable Autorun 2012 as a courtesy, and makes no representations regarding Disable Autorun or any other applications or any information related thereto. Any questions, complaints or claims regarding this application Disable Autorun 2012 must be directed to the appropriate software vendor. You may click the publisher link of Disable Autorun on the top of this page to get more details about the vendor.